Chocolate and champagne are perhaps the most evocative legal substances on Earth. Combining them makes for a stellar cruise theme brought to you by the one of the most qualified and charismatic couples in barging, Captain Jason Ashcroft and Chef Dawn Coles. Aligned with Dawn and Jason’s sophisticated palettes, excursions introduce guests to many local attractions, among them an indulgent exploration into the aforementioned pleasures of chocolate and champagne. Guests enjoy special champagne tastings at small vineyards, while a sampling at a boutique chocolatier appeals to, well, everybody. In the afternoon, you will be met by a crew member of the Saroche at the designated meeting point. From here, relax as you are chauffeured to the barge, moored in Vandieres. A traditional champagne welcome and introduction to the crew awaits you, before your first of many gourmet dinners onboard. Enjoy a nightcap on the deck by the firepit to end the day! Today your Tour Guide escorts you to the chateau of Conde en Brie. This 16th century hunting lodge has hosted Kings, Queens, and all kinds of characters both well-known and unknown. An afternoon cruise presents the perfect opportunity to relax on deck, or explore the towpath with a bike ride or leisurely stroll. Join Chef Dawn in her show kitchen for the first of many cooking lessons. Captain Jason introduces you to "bubbles du jour" with a champagne tasting, preceding tonight's gourmet dinner. Champagne and Chocolate, Bien Sur! This morning, your Tour Guide accompanies you to a chocolate making lesson at the boutique chocolatier Thibaut. Spend the morning creating artisanal chocolate with the master chocolate maker, famous as the last chocolatier to make the alcohol-filled chocolate champagne cork. 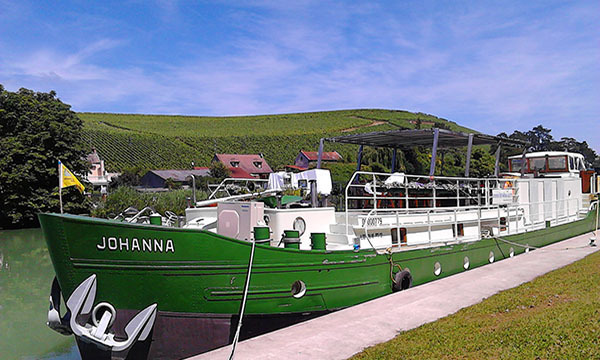 Back onboard, laze on deck and admire the bucolic countryside, or explore the towpath by bicycle or on foot. Chef Dawn offers another culinary demonstration, while Captain Jason presents a new champagne sampling with canapes before dinner. The first of many excursions today begins in the Eisenhower War Rooms, an important yet little-known museum where the first treaty to end the World War II was signed. Then visit the Cathedral of Reims, where the Kings of France were crowned. Lunch is ashore in the Jardin Brasserie at Domaine Les Crayeres, once home to the Pommery family, and currently of the best small hotels in the world. En route back to Saroche, stop at a small champagne house for a tasting preceding another gourmet dinner on board. The day begins with a visit to a boutique champagne house. Tour and taste! Your Tour Guide chauffeurs you back to the barge for an afternoon cruise, which is the perfect time to laze on deck or join Captain Jason is his wheelhouse. Chef Dawn offers another cooking demonstration in her open kitchen, and after “bubbles du jour” another delightful dinner awaits. Enjoy a nightcap under the stars while relaxing by the firepit. A morning cruise is the perfect time to laze on the deck or explore the towpath with a gentle pedal or leisurely stroll. Upon mooring, your Tour Guide escorts you to the World War I trenches at the Mains de Massiges, an archeological dig that is as authentic as it is mysterious. These trenches are the newest discovery involving Champagne’s history in the war. Back onboard, preparations have been taking place to present a festive cocktail hour and celebratory Captain’s Dinner to culminate your cruise.